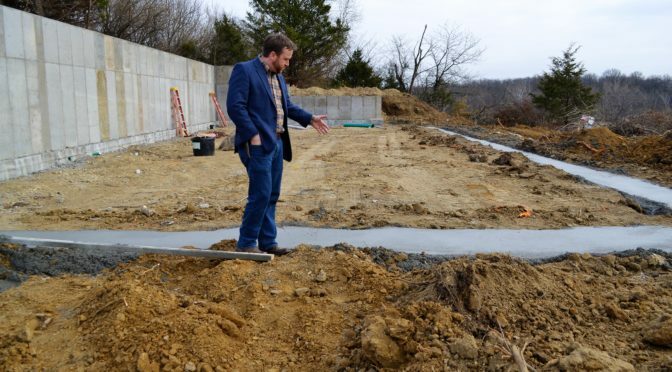 Daniel Kerr, president of St. Martin’s Academy shows the newly poured foundation to the first building in construction at the school. Years in a Pennsylvania boarding school created a passion and vision for education for a local Fort Scottian. Daniel Kerr’s experience altered him. “It was a life-changing experience,” Kerr said. 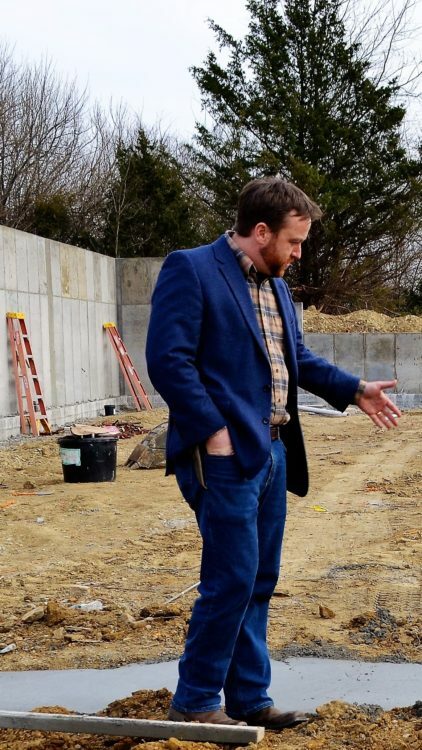 Since that time Kerr has had an interest in developing a boarding school that would incorporate farming into the school curriculum and has been working towards that vision and laying the groundwork. 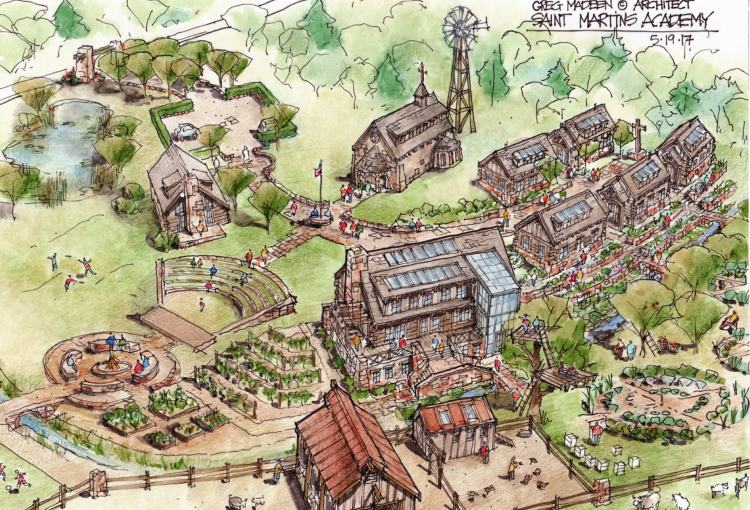 Thus plans were begun for constructing St. Martin’s Academy, a boys Catholic boarding school. The Kerr Family Estate deeded to St. Martin’s Academy about five acres of land west of Fort Scott on Indian Road. Daniel Kerr met with the bishop and vicar-general of the Catholic Diocese of Wichita to tell them of his vision. “They are enthusiastic and have been supportive of our plans,” he said. In October 2017 construction began of phase one, Theotokos Hall. Kevin Klassen Construction, Kansas City, is the main contractor, Kerr said. The architect is Greg Madeen, Durango, CO, who does alternative energy construction and design. This month the City of Fort Scott granted the school a land use permit. Also this month, the footings for the first building were laid. The footprint of the hall is 74 feet by 36 feet, with a full basement, first floor, and loft area, totaling over 6,000 square feet, Kerr said. Theotokos Hall is the first and largest building and will be constructed of native oak timbers and stone. “Overall, the school campus will be situated on five acres with access to 200 acres,” Kerr said. “We live on the property and built a house here. Kerr is married with children. The school will be using passive solar and hope to have a windmill for electrical and also active solar, he said. Theokotos Hall will serve the needs of the school for the first year before becoming the permanent dining hall and hearth. It is slated for completion in July 2018. Eventually, there will be five separate buildings on the site. By 2022 there is a plan to complete construction on the crowning feature of the campus, a chapel made of native stone. Patrick Whelan, who will be the new headmaster, has moved to Fort Scott with his family and has been working on the school’s curriculum development and educational compliance, along with recruiting students, Kerr said. “We are blessed to be able to work together for about 15 months of preparation leading into the first academic year,” Kerr said. “We’ll be applying for grants, benefactors, and financial partners interested in investing in a bold new adventure in education,” Kerr said. F.O.R.T Leadership Camp will be offered April 16-22, 2018 and again June 11-17, 2018 for boys ages 12-14. Cost is $500 per session. The young men will learn to build a fire, make a shelter, forage for food, race kayaks, serve mass and butcher a hog, according to information provided. Visit: SaintMartinsAcademy.org/#camp. 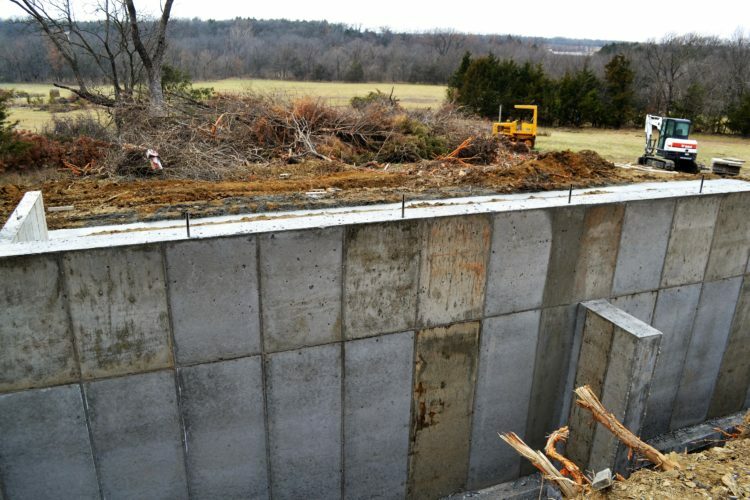 This photo shows the foundation wall of the first building being built at St. Martin’s Academy on December 20. The Fort Scott Lake overflow area can be seen from the school. St. Martin’s Academy is located at 1994 Indian Road, Fort Scott, KS, 66701. The phone number is 620-223-2704. Very good idea. The formation of young minds for active leadership in society is sorely needed. How very wonderful! !…now we need one for girls! Where could I apply for a Housekeeping position ?